Staff Photo by Dan Henry / The Chattanooga Times Free Press- 11/14/16. 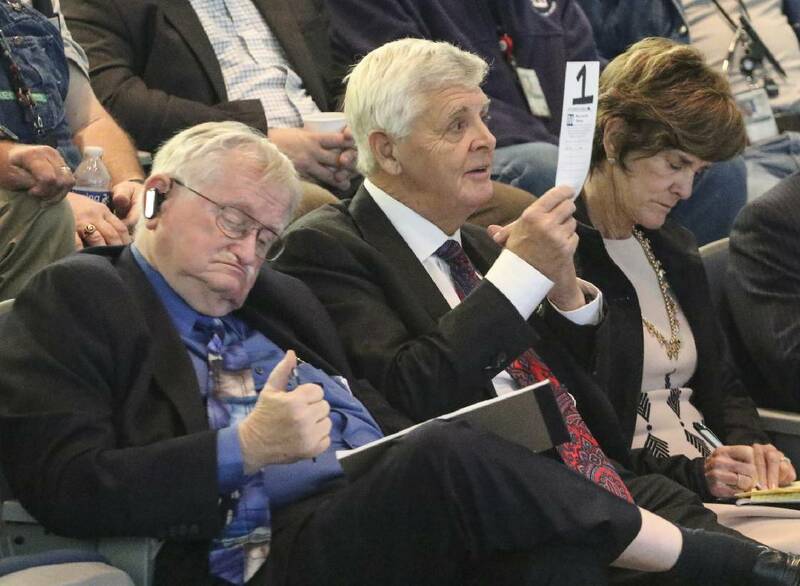 Franklin Haney, representing his company Nuclear Development, LLC., bids against Aaron Abadi, the CEO of National Environmental Group representing Jackson Holdings, during an auction of Tennessee Valley Authority's Bellefonte Nuclear Power Plant in Hollywood, Alabama, on Monday, November 14, 2016. Nuclear Development, LLC., won the auction with a bid of $111,000,000.00 entering them into a contract to purchase the currently non-operational power plant. The purchasers stated in a press release that the project is expected to require an additional investment of up to $13-billion to complete and will create over 3,000 temporary construction jobs and an estimated 2,000 full time jobs when fully operational. The Tennessee Valley Authority says it cannot complete the sale of its Bellefonte Nuclear Power Plant to developer Franklin L. Haney because Haney doesn't have a license yet to operate the unfinished twin-reactor plant in Alabama. Haney's company, Nuclear Development LLC , was the top bidder for Bellefonte at a TVA auction of the abandoned plant in November 2016. But Nuclear Development only filed a license transfer application with the U.S. Nuclear Regulatory Commission (NRC) to take over TVA's construction permit on the Bellefonte plant on Nov. 13, 2018 — two weeks after the sale was originally supposed to close and only 17 days before an extended deadline for the sale on Nov. 30. TVA told Haney the day before the Nov. 30 sale was supposed to be completed that it could not sell Bellefonte as a nuclear plant without approval of the license transfer by the NRC. In the sales agreement with Haney, TVA said "federal law at all times govern the validity, interpretation and enforceability" of the sale. "The NRC did not approve transfer of the construction permits to Nuclear Development by the Nov. 30, 2018 closing date so TVA refused to close on the sale of the Bellefonte Site," said Matthew H. Lembke, a Birmingham, Alabama attorney hired by TVA who prepared the legal brief defending TVA's decision not to complete the Bellefonte sale. "Because the closing did not occur by that date required under the agreement (with Haney's Nuclear Development), the agreement expired by its own terms." In November 2016, TVA entered into a sales agreement with Haney's Nuclear Development LLC to sell the 1,300-acre Bellefonte site and its nuclear facilities for $111 million. Haney has hired TVA's former chief operating officer Bill McCollum and nuclear chief Preston Swafford along with the Canadian-based engineering firm SNC-Lavalin to develop plans to finish construction of the two Babcock and Wilcox pressurized water reactors at Bellefonte. TVA filed its motion to dismiss the lawsuit more than two months after Haney sued TVA to enforce the sales agreement. Haney said he had been working with TVA in good faith to complete the sale and work toward finishing Bellefonte, which Haney says could create thousands of jobs in Jackson County, Alabama and provide a lower cost source of power in the region. The legal fight over whether TVA must now sell the Bellefonte plant to Haney is moving in some uncharted waters since the NRC has not previously transferred a deferred construction permit on a nuclear plant to a private individual or a company that has not previously operated a nuclear plant. NRC spokesman Scott Burnell said last month that the NRC staff is still reviewing Haney's application to take over the deferred construction permit. Although no active construction has occurred at Bellefonte in nearly a decade, TVA has maintained the plant in deferred status. In their motion to dismiss Haney's effort to complete the Bellefonte sale, TVA's attorneys cite federal rules that "it shall be unlawful....to transfer, acquire, possess, use, import or export any utilization or production facility except under and in accordance with a license issued by the Commission." "If TVA were to transfer the Bellefonte site without prior NRC approval, it would put TVA in violation of the permits, " Lembke said in the court filing. TVA has requested oral arguments in the dispute with Haney, but no hearing has yet been scheduled. TVA originally obtained a construction permit for Bellefonte in 1974 from the Atomic Energy Commission, the federal agency that regulated nuclear power before the creation of the NRC. In that application, TVA said it expected to finish the the first Belefonte reactor by 1979. But after years of delays and cost overruns, TVA suspended work on the Bellefonte plant in 1988 when the utility said the first reactor was nearly 90 percent complete and the second reactor was about half finished. Although TVA extended its construction permits and considered other alternatives for the Bellefonte property, the federal utility finally declared the plant surplus three years ago and agreed to sell Bellefonte for only a fraction of the more than $6 billion TVA has poured into the complex over the the past 45 years. TVA removed some of the equipment from Bellefonte and changing nuclear regulations would require major retrofits of the plant before it could generate power as a nuclear power plant. But TVA has maintained the plant and its construction permit in a deferred status. Although TVA once projected it would cost at least $8 billion to finish one of the Bellefonte reactors, SNC has estimated the Unit 1 reactor at Bellefonte could be finished for about $3 billion and a second reactor could be completed a couple of years later for around $10 billion or so. The total cost of completing Bellefonte is projected to be only about half of what is projected for a similar size plant in Georgia. Haney, who contributed more than $1 million to President Trump's inaugural fund through a limited partnership known as HFNWA and once hired Haney's personal attorney Michael Cohen to help with the Bellefonte project, has applied for federal loan guarantees for Bellefonte. The U.S. Department of Energy is still considering Haney's loan application. TVA mothballed Bellefonte and eventually gave up on finishing the plant because of a slowdown in power demand in TVA's 7-state region. TVA once planned to build 17 nuclear reactors but after finishing seven units at its Browns Ferry, Sequoyah and Watts Bar plants, TVA projects it will not need major base load power generation like what a nuclear plant produces any time in the next two decades. 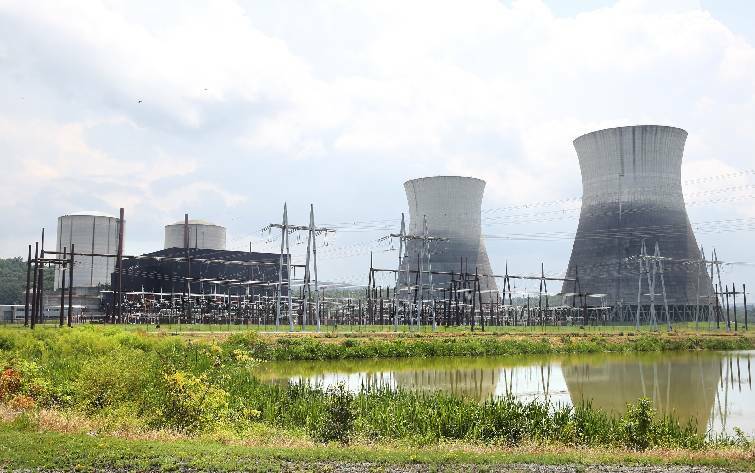 Haney is more optimistic about the demand for power, although he has yet to identify who might buy the 2,400 megawatts of electricity that two Bellefonte reactors could produce. McCollum has met with TVA's biggest customer, Memphis Light, Gas and Electric, about potentially buying power generated by Bellefonte. MLGW is still studying the offer. "For many years, I have been committed to the Tennessee Valley, having invested billions of dollars in a region that continues to outpace the rest of the country in terms of job creation and economic growth," Haney said in a statement last year when he met with contractors about finishing Bellefonte.